The North East Call to Action on Global Poverty and Climate Change (NE-CAP) is a voluntary association of people which aims to promote action to relieve severe poverty in less developed countries and curb climate change. In a much broader sense, we call for action to promote economic justice and to provide a sustainable future, ‘for all, for ever’! Our grouping can be traced back to the ‘Tyneside Jubilee 2000’ (1997-2000), the ‘Jubilee Debt Campaign NE’ (2001-2004), and the ‘Trade Justice Movement NE’ (2003-2004). 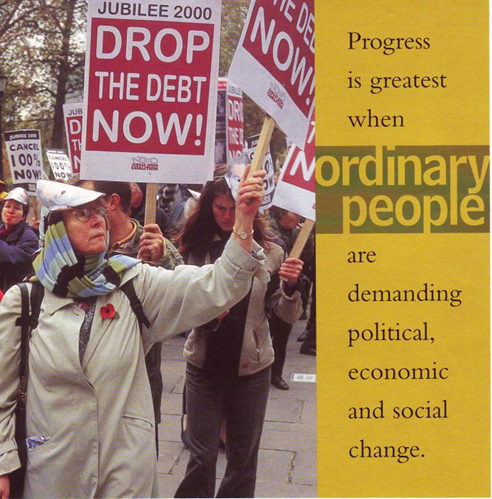 In 2005, the regional Jubilee Debt and Trade Justice Campaigns merged into an expanded grouping to support MAKEPOVERTYHISTORY. Much campaigning was done in 2005 to persuade our government, and the governments of other richer countries, to act to alleviate global poverty. During 2005, local groups throughout the country supported the aims and activities of the national MAKEPOVERTYHISTORY campaign. A group emerged in the North East which consisted of individuals and representatives from various organisations. This group co-ordinated various events and campaigns throughout 2005. The national MAKEPOVERTYHISTORY organisation was only designed to run for the year 2005 and has now formally ceased operations. You can read an evaluation report about the national campaign of 2005. However, the group in the North East decided to continue to meet and act for the foreseeable future. Prior to September 2010 we were known as MAKEPOVERTYHISTORY North East. In September 2010 our name was changed to North East Call to Action on Global Poverty and Climate Change (NE-CAP). One main reason why the name was changed was because memories in the general public’s mind of the national 2005 campaign called MAKEPOVERTYHISTORY seem to be fading and the term MAKEPOVERTYHISTORY North East may be confused by some people to mean that we aim to act against poverty in the North East of England.